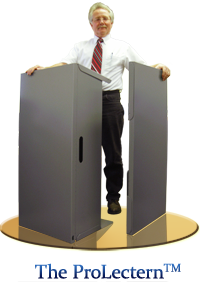 As a teacher or professor, you may wonder, “How would a portable podium be useful in my classroom? 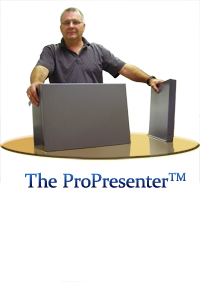 Do I need a portable or tabletop lectern?” ProProducts’™ collapsible podiums and tabletop lecterns have many uses in a classroom, whether you teach preschoolers or graduate students. Here are just a few examples of how podiums and lecterns are useful in different types of classrooms. If you’re a preschool teacher, you probably don’t stay behind your desk all day. Little ones are active and many preschool activities require plenty of room. With a ProPodium from ProProducts™, you can collapse your podium in seconds after teaching or reading time is over to make room for a fun group game! Elementary classrooms use podiums for a variety of purposes, but some classrooms may use them only on occasion. 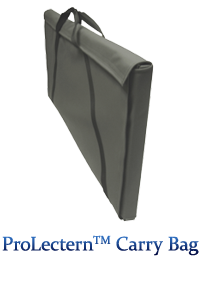 If you frequently sit behind a desk, but would appreciate the convenience of a lectern for student presentations or to keep notes at a better height when standing and teaching, a ProProducts’™ portable tabletop lectern may be a perfect “fit.” Stow it under the desk when not in use, and pop it up in seconds when you need a place to rest a book, hide teaching aids until needed, or even set your drink in one of its two cup holders. Many high schools and colleges bring in guest lecturers, who may have notes, props, highlighters to make notes on the projector screen, and a drink to juggle. Instead of making them set everything out on a desk, how about providing a sleek portable podium or tabletop lectern? Besides being lightweight and quick to set up, ProProducts’ ™ ProLecterns™ and ProPresenters™ are strong and fully equipped with everything a speaker needs to feel comfortable. A built-in cabinet, shelf, dual cup holders, and media ports cover most any presentation need, and the weatherized exterior finish and aluminum construction make cleanup easy in case of coffee spills. College classrooms present perhaps the most obvious use of a portable podium--student presentations. On speech day, imagine how easy it would be to pull out a lightweight, all-one-piece aluminum podium from its spot hanging on the back of a door in tucked in a closet instead of dragging a huge, heavy wooden podium from across campus. Students can even set a laptop on the built-in shelf, flip up the top to make a 90 degree surface for a projector, and run wires through the portable podium’s media ports for the perfect presentation media aid. From a kindergarten teacher reading a story to a guest speaker giving a graduate lecture on economics, portable podiums and tabletop lecterns offer a wide variety of classroom applications. Tell us how you currently use ProProducts™ in your classroom via our feedback form.